Our Aging in Place renovation project is now finished. Over the past ten weeks, our crew has transformed this cramped master bathroom with wasted space into a more open room that will be accessible to our retired Isle of Palms homeowners. 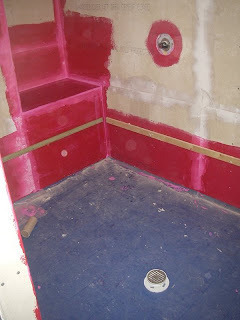 The finished photos show that the bathroom now has a roll-in shower, large floor area for comfortable toilet transfer, and a vanity that would accommodate a wheelchair. The updated space has even flooring for easy transfer in and out of the shower. 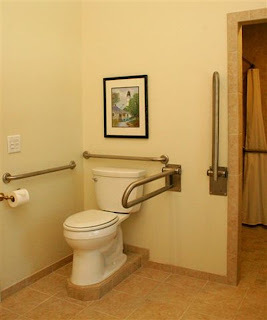 The commode is now elevated and with grab bars around the area. 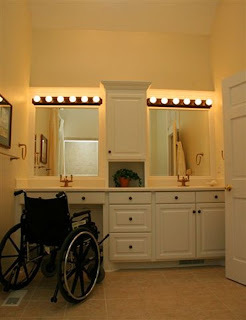 The custom-made vanity boasts better lighting and a wide space that can accommodate a wheelchair. The project is an example of a smooth design/build transition. CEInc’s architect, Alice Nixon Burress, designed the bath. Then, the construction division took over the project and worked out the details of grab bars and vanity, with the involvement of Pete Loy, company president and a Certified Aging in Place remodeler. 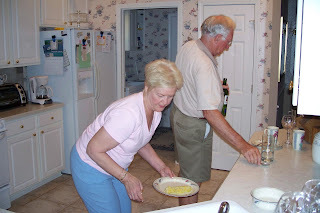 Citadel Enterprises is committed to helping mature adults stay in their own homes. From simple modifications to complete room renovations, Citadel Enterprises can create the ease and comfort the aging homeowner desires. Call Pete Loy today at (843) 884-4303 to schedule your Aging in Place home assessment. You can also learn more by going to the company’s website at www.citadelenterprises.com. Citadel Enterprises is committed to helping the maturing generation make their lives more manageable and comfortable. We promise to go Beyond Expectations. Our Aging in Place renovation is close to completion. The crew just finished transforming the shower from a traditional shower to a shower that will accommodate the maturing owners’ needs. The updated shower is now fitted with a handheld shower head, a built-in seat and hand rails. A handheld shower fixture, in addition to (2) fixed heads, will make it easier for this couple to bathe when seated. A handheld also facilitates cleaning. This finished built-in seat will allow the couple to sit while showering. 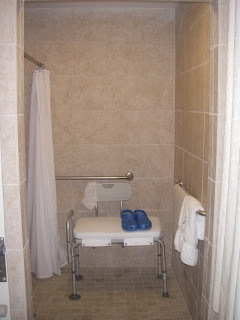 This is a comfortable transition area between the wet bathing area and the dry main bathroom floor. 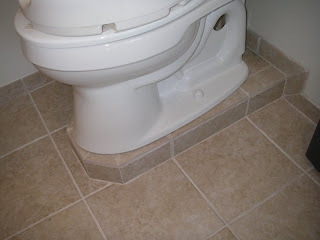 The last step in this remodel will be completing the raised area below and railings around the commode. Plus, the crew is putting the finishing touches on the custom designed vanity. If you have any questions about this remodel, contact us at (843) 884-4303. We are here to help you or your loved one stay in their home and Age in Place. This Aging in Place renovation is moving forward. The carpenters are now working on making the changes to the shower that will allow this Isle of Palms couple to easily bathe without worrying about slipping or having to stand for a long period of time. The built in seat will allow the couple to sit while they shower. 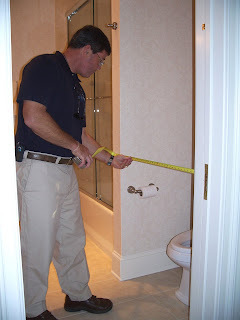 In addition to framing the shower, the crew needed to make an adjustment to the commode. The man living in this home is tall and needed extra height added to it. The husband in this home is tall so this custom platform make thes commode more accessible for him. In addition to working on the bathroom, the crew is also making changes to a French door that leads to the couple’s porch. Our carpenters are making the doorway to their outside space more wheelchair accessible by lower the threshold leading out to the porch and changing the door swings. Citadel Enterprises is committed to helping aging adults stay in their own homes. From simple modifications to complete room renovations, Citadel Enterprises can create the ease and comfort an aging homeowner desires. Learn more on our website. Citadel Enterprises is committed to helping the aging generation make their lives more manageable and comfortable. We promise to go Beyond Expectations. The crew continues its work on this Aging in Place remodel on the Isle of Palms. With the sheetrock complete, now it’s time to start thinking about working on the updating the shower and laying the bathroom tile. 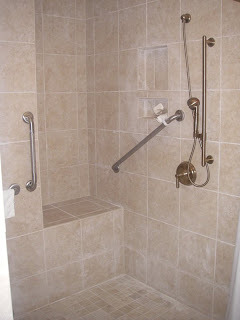 The most important improvement to the shower is that the entrance needs to be level with the floor so the couple can easily roll their wheelchair up to the edge of it. 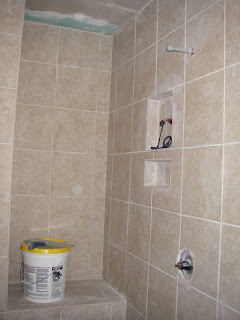 Here is a look at the work on the shower. 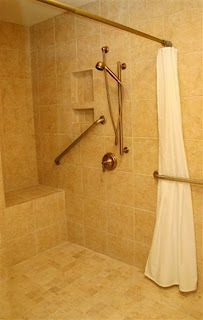 Now that the shower entrance is level with the floor, the couple is able to easily get in and out of it. The crew installed a seating area in the shower. 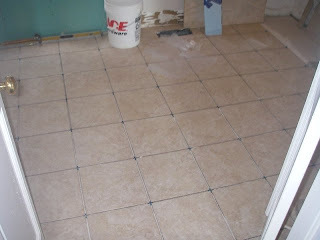 This new tile will accent the look of the new updated bathroom while allowing accessibility for the homeowners’ needs. 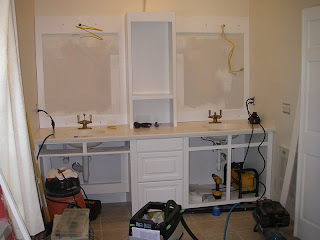 In addition to the shower stall, the Citadel Enterprises' crew is revamping the couple’s bathroom vanity. The left of the new vanity cabinet will allow the homeowner to roll the wheelchair up to the edge of the vanity, due to a generous knee space. 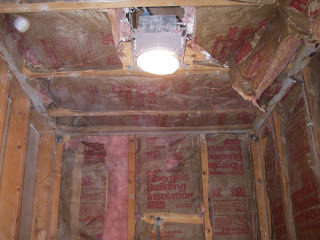 The crew installed lighting above where the new mirrors will be installed over the countertop. Citadel Enterprises is committed to helping aging adults stay in their own homes. From simple modifications to complete room renovations, Citadel Enterprises can create the ease and comfort the aging homeowner desires. Call Pete Loy today at (843) 884-4303 to schedule your Aging in Place home assessment. Progress is being made in our Aging in Place renovation. Now that demo is complete, the crew is beginning to work on making the changes to the space that will allow this couple to age in place safely. 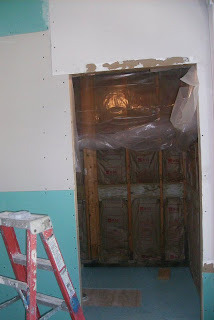 One of the first steps is hanging the sheetrock in what will be the updated bathroom. 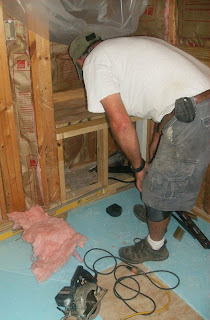 The crew is framing a built-in shower seat. shown with newly installed sheetrock. Some of the heat & air conditioning ducts needed to be relocated. 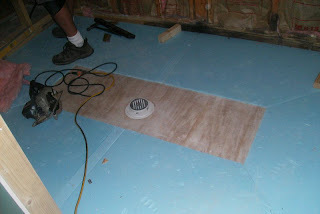 prepped for a waterproof membrane. 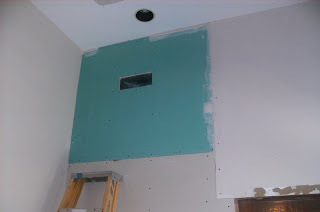 Once the sheetrock is put up, the crew will cover the nails and seams with putty and will then sand the sheetrock. The next step for this aging in place remodel will be laying tile and updating the bathroom vanity to make it more accessible to the couple’s wheelchair. Any type of lengthy renovation can be nerve-racking on a homeowner. Citadel Enterprises does everything it can to make the remodeling process as stress free as possible. Before any type of work begins, CEInc sends a questionnaire to all clients before a job begins. The answers to these questions let the crew know what steps it can take to make the renovation as easy as possible for the homeowner. Citadel Enterprises believes that open communication is the vital in any renovation. If you’re an aging adult, perhaps it’s time to have Pete Loy, Citadel Enterprises’ Certified Aging in Place, evaluate your home. He can recommend the changes and upgrades that need to be made to ensure you Age in Place safely. Call us at (843) 884-4303. The first step in making this Isle of Palms home more accessible to its aging owners is to demo the bathroom to make way for the upgrades. The crew at Citadel Enterprises spent 5 days knocking down walls and pulling up floors. The crew was following the architectural plans designed by Citadel Enterprises’ architect, Alice Nixon Burress. The mud bed was thick and a challenge to eradicate; however, the crew managed to remove it. 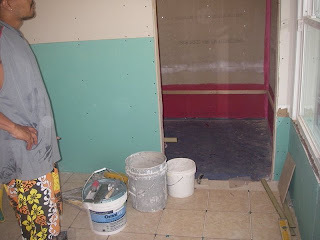 The walls of the bathroom are now gone. This is above the ceiling of the old shower. 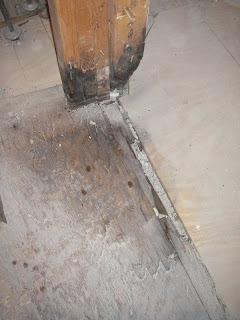 The crew found rotting wood under the floor shower area. They will repair this during the renovation. 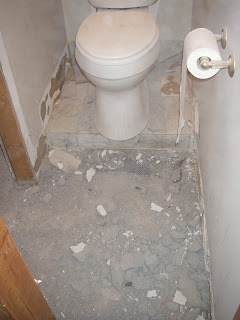 This is the floor of the demolished shower. With the demolition complete, the crew now has a “clean slate” for which to start making the improvements to the bathroom. Up next, the Citadel Enterprises crew will begin adding the details to the space that will allow this couple to age in place safely. 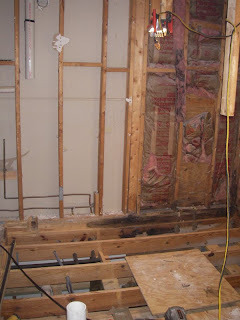 As a homeowner, you are probably wondering how one survives the demolition process of a room remodel. There is the noise, the clutter and the dust. You don't have to worry about these tribulations when you partner with Citadel Enterprises. Our crews clean the job site at the end of every day. Keeping the work site clean is one aspect of its business model that sets Citadel Enterprises apart from other home remodeling companies. The staff at Citadel Enterprises understands that a neat and orderly space will result in less stress and more comfort for the homeowner. When you’re ready to make those important changes to your home that will allow you to make it more accessible to your changing needs, call Citadel Enterprises at (843) 884-4303 or e-mail us at beyondexpectations@citadelenterprises.com. We promise to go Beyond Expectations. As adults age, they need to start thinking about what modifications they may need to make to their homes so they can live there safely. In other words, how long will they be able to age in place? Citadel Enterprises’ President, Pete Loy, is one of only two Lowcountry contractors who is a Certified Aging-in-Place Specialist. He has been taught the strategies and techniques for designing and building aesthetically enriching, barrier-free living environments for elder adults. Additionally, CEInc. 's architect, Alice Nixon Burress, can lend her expertise in visualizing workable layouts. She can meet with the client and design a space that will help them age in place safely. 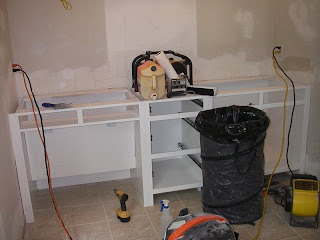 Over the next several weeks we will document an Aging in Place remodeling project on our blog. This home is on the Isle of Palms and is owned by a couple in their 70’s who need to make their house more accessible to their changing needs. The project includes extensive renovations in their bathroom. 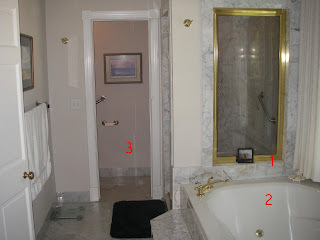 They need better access to shower and commode area and they want Citadel Enterprises to customizing the vanity. 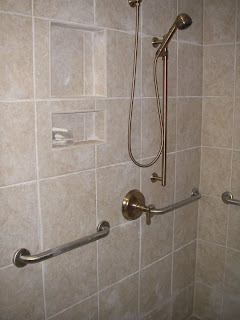 The master bath is not wheelchair accessible and stored items are difficult to reach. The couple’s shower has a curb on the floor which is too high for them to step over (1). Moreover, the shower is cramped, dark and tiny. Meanwhile, the whirlpool tub robs valuable space and is too difficult for the couple to get in and out (2). Plus, the commode area is narrow and confining and needs to be wheelchair accessible which means there needs to be a 5’ turning radius (3). Additionally, the owners need the CEInc. crew to make the doorway to their outside space wheelchair accessible. 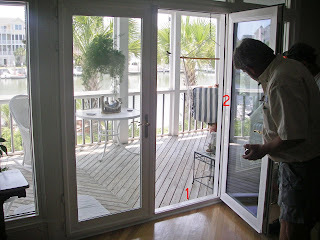 Citadel Enterprises will lower the threshold leading out to the porch (1) and change the door swings (2). A project of this type usually takes about 10 weeks. 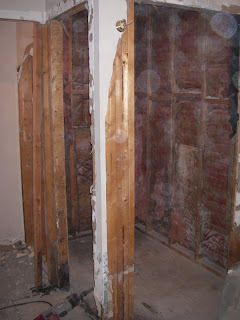 During that time, Citadel Enterprises will work with the homeowner to make the renovation as stress free as possible. Citadel Enterprises is committed to helping aging adults stay in their own homes. From simple modifications to complete room renovations, Citadel Enterprises can create the ease and comfort the aging homeowner desires. Call Pete Loy today at (843) 884-4303 to schedule your Aging in Place home assessment. You can also learn more by going to the company’s website at www.citadelenterprises.com. Citadel Enterprises is committed to helping the aging generation make their lives more manageable and comfortable. We promise to go Beyond your Expectations.